Located in Sitka, Alaska Sitka National Historical Park commemorates the site of a seminal battle between the indigenous Tlingit people and invading Russian traders, preserving the experiences of both groups in the area and the ways they shaped Alaskan culture. The earliest known inhabitants of the Sitka area were the indigenous Tlingit people, whose territory, at its peak, spanned the area that now encompasses the border of British Columbia and Alaska, from the Portland Canal north to the Copper River delta. As a hunter-gatherer culture, the Tlingit fished for herring, halibut, and cod in the area’s waters, building canoes carved out of cedar tree trunks. European exploration of the Alaska area began in 1741, as part of commissioned expeditions by Russian Tsar Peter I. The area was soon established as a hub for sea otter fir trade, with private trading companies consolidating into a state-sponsored Russian American Company. In 1799, facing trading competition from the Americans and British, the RAC established a trading post near present-day Sitka with the help of the local Tlingit people. The trading post was soon replaced by fortifications, known as Fort Saint Michael, which included a barracks and a warehouse storing facility for furs. Unhappy with the development of the facility, the Tlingit led an attack on the fort in 1802, known as the Battle of Old Sitka, which completely destroyed its structures. Two years later, the Russian traders returned to the site to seek revenge and reestablishment, a move which resulted in the Battle of 1804. Though the Russians were nearly defeated, a Tlingit supply of gunpowder was accidentally destroyed near the close of the battle, resulting in a strategic retreat. Several decades of conflict between the two forces ensued, until overhunting resulted in Russian retreat from the territory in the 1850s. In 1867, Russia’s Alaskan territory was sold to the United States for a sum of $7.2 million, ending Russian commercial activity in the area. The territory of the Battle of 1804, including the Tlingit fort Shis’ki Noow, was designated as a federal historic site in 1890 by United States President Benjamin Harrison. Throughout the first years of the 20th century, indigenous totem poles were collected from sites throughout Alaska for display at the park. After vandalism and poor maintenance threatened the totem poles, the site was declared a National Monument in 1910 as a result of citizen activism efforts. Throughout this period, it was known as Indian River Park and later Totem Park. In 1972, the park was designated as a National Historic Park. Today, the 112-acre peninsular park is operated by the National Park Service and the United States Department of the Interior and is listed on the National Register of Historic Places. Totem poles are still viewable along the park’s two-mile pathway system, although many are replicas of deteriorated original poles. Much of the park’s land consists of a temperate rainforest environment, which contains old growth portions among its closed canopy of Western hemlock and Sitka spruce trees. Open meadow at the edge of the forest gives way to the Indian River estuary, which contains a wetland and beachfront area. The park is home to a rich variety of animal life, including the Indian River’s pink and chum salmon population, which migrate to the region yearly for mating. Birds of prey are common, including bald eagles, gulls, and ravens, and Sitka blacktail deer and brown bears can be seen periodically. Views of the nearby Alaskan shoreline provide views of whales, seals, sea otters, and sea lions. Structures inside the park include the Russian Bishop’s House, which serves as one of only a few extant examples of Russian colonial architecture on the continent. Constructed in 1842, the House was the central building for the Russian Orthodox Church in America until 1969. The National Park Service began renovation of the property in 1973, restoring the once-crumbling building to its original 19th-century architecture. The historic Tlingit Fort Site also remains commemorated in the park, now a grassy opening within the forest. 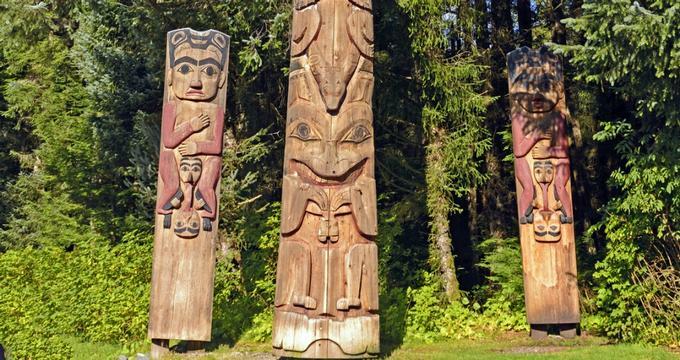 Two walking trails depart from the park’s Visitor Center, the Russian Memorial Loop, which commemorates the Battle of 1804, and the Totem Trail, which highlights the park’s 18 totem poles. For advanced hikers, the 2.5-mile Mount Verstovia Trail, the 4.5-mile Indian River Trail, and the 6-mile Gavan Hill-Harbor Mountain Trail provide scenic views. Beach Discovery Packs, available at the park’s Visitor Center, offer tools for young visitors to explore the park’s intertidal coastal area, including buckets, magnifying glasses, and digging tools. A Junior Ranger Program is also available, featuring a scavenger hunt through the park to complete age-based activities before returning to the Visitor Center for a participatory badge and certificate.